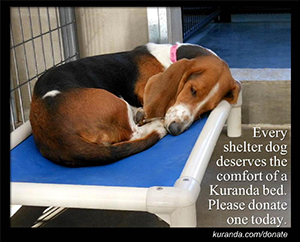 The Saint Bernard Rescue Foundation, INC. Please support Saint Rescue with a purchase of these great wines! Hale Pet Door™ is dedicated to improving the lives of pets around the country and around the world. We are proud to sponsor a pet rescue program to promote adoption of animals from a network of humane societies and rescue organizations throughout the country. This program is designed to benefit the consumer, the adopted animal, and the rescue organization. Customers who have adopted a pet from a legitimate rescue organization, shelter or humane society and who purchase one of our pet doors will receive 10 percent off the cost of their door. It is our way of saying "thank you for opting to adopt and thereby save a life." We also will send a check for that same discount amount to the rescue organization as our gift to them. Click the above link for more information. Sweetwater Nutrition® knows firsthand how bringing a pet into your home can enrich your life. That's why we proudly form partnerships with rescue organizations that are dedicated to finding loving homes for adoptable pets. Sweetwater Nutrition® produces a complete line of all-natural supplements for dogs and horses, using human grade ingredients that are scientifically formulated to support the animal's health. From joint supplements to skin and coat formulas, vitamins, digestive aids and antioxidants, we are dedicated to providing quality products for your pet. Buy any of our products online at SweetwaterNutrition.com and we'll give you a 10% discount on your purchase, plus we'll also donate 10% to the Saint Bernard Rescue Foundation, Inc. Use Code "SBR1" at checkout. Hendrick Boards, the premiere skateboard and apparel company that embodies the Orange County beach lifestyle, today announced that the Company has expanded its giving product lines. Each and every Hendrick Boards product purchased online or in retail stores gives back to local animal shelters and pet adoption programs across the nation. Support rescue through Big Dog Sportswear you save 15% and we get 15% back from your purchase. In honor of Molly and all the shelter animals like her, we donate 10% of each purchase to the Saint Bernard Rescue Foundation and other large breed rescue groups. Welcome to Seasons & Celebrations! To view our collection of tree skirts, mantel scarves, table runners and other holiday gifts and decor (Click on link (Picture) above).